Let's start with the furniture. Obviously you can see in the board our vision of the seating in the living room but we wanted to talk through all of the existing pieces. Suzy wanted to ditch her current couch and get something new. She wasn't set on a sectional...SO! 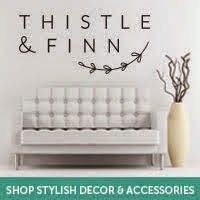 We found a super ah-mazing deal at CB on upholstered furniture AND we included our favorite tufted chairs, The Cute as a Button Chair from WM. Two of course to create an intimate seating area. 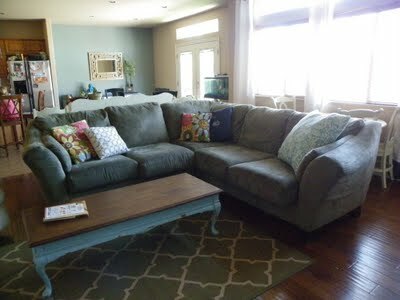 We chose a neutral couch so it can stay with their fam for years! To liven it up, colorful patterned pillows of course. Luckily we love coral just like Suzy does. She makes our job so easy! 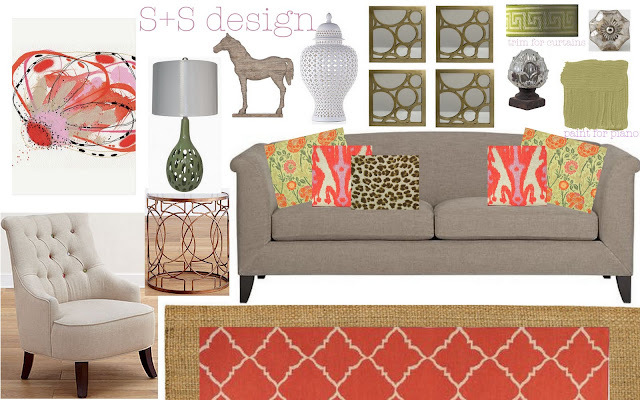 We absolutely love Suzy's current coffee table! To fit into the scheme of the room, we were thinking they would paint the legs coral, to make it pop. We are totally feeling the natural wood surface and want that to stay! We adore her lattice rug and will love the look of it layered over an oversized jute rug. 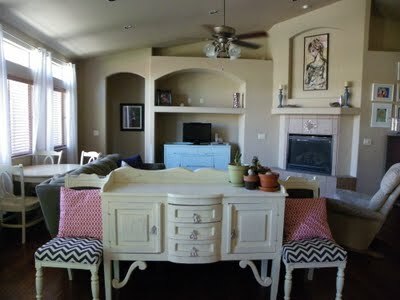 On the coral coffee table, we are including different sized white washed lanterns on the corner and possibly a tray to hold remotes, etc. Looking through Suzy's current pieces, we LOVED her white credenza that she currently has opposite her couch. We were thinking that could become the new TV credenza, with the addition of some mercury glass knobs on the piece to give it an updated look. A fun addition to that credenza would be a unique lamp and maybe off center the TV. As far as the blueish credenza, we were thinking we could put that behind the couch in the place that the white cabinet is currently. Flip flop. On to art. The arrangement of the 4 bronze bubble mirrors over the fireplace will be divine. It will give an interesting feel to that space. The print that we included on the board can really go on any free wall space that she currently has. 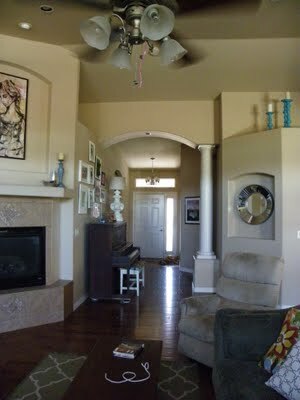 We were thinking perhaps on that corner wall behind the existing couch or even in the open soffit above the TV. Our suggestion to Suzy was to paint a large canvas as a backdrop in that soffit and then start layering with accessories to add dimension in that space. Accessories! We are thinking the quatrefoil urn or maybe some lilac candlesticks would be a fun addition to the mantle. 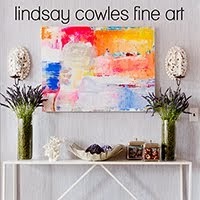 The driftwood horse is intended for the soffit above the TV or even possibly the mantle. He has yet to find a permanent home. We have included some greek trim ribbon to add to her existing drapes. 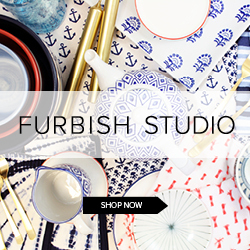 We think they are a great basic and could be zhushed up with a little patterned trim. It would be a quick and easy project. Look at this adorbs piano area styled by Suzy! Like she needs our help! We told her to keep this space in tact. We love it all. Our only suggestion was possibly some trim around the lampshade and also, painting the piano. Suzy was totally open to this idea! 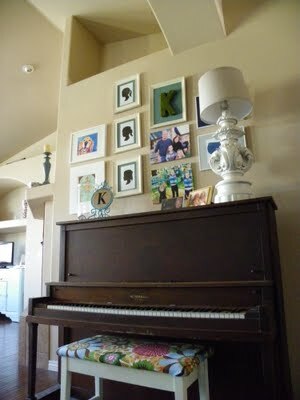 We chose a more neutral shade of paint that we think would look phenomenal on the piano. Suzy has been such a blast to work with and we CANNOT WAIT to see the end result! I can't wait also! I'm really enjoying your ideas. So interesting. This will be fun! I LOVE your mood board..tres chic! Great space, just needs a talented and sophisticate eye (yours) so cannot wait to see the end result! Great suggestions. Can't wait to see the 'after'. Love it ladies! Can't wait to implement your amazing suggestions. Great pieces! I love that rug! So fun! I love the design board that you came up with for Suzy and I can't wait for her to implement. Love the couch and chair you have proposed. S+S Style Steals. What we are loving under $150.